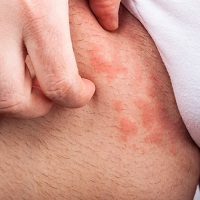 A review in Allergy suggests a strong connection between some cases of chronic spontaneous urticaria (CSU) and parasite infections (PI). This connection has been suggested for more than 65 years, but this exhaustive review collects significant evidence for the presence of PI in some cases. The finding is important, because in a startling 90% of CSU cases, the search for underlying causes is unsuccessful. Potential underlying causes include autoimmunity, food intolerance, and infections. The current review of 39 independent studies found that the prevalence of PI in adult and pediatric patients ranged from 0 to 75.4%. “CSU patients were more often diagnosed with protozoa, had a significantly higher risk of toxocariasis seropositivity and Anisakis simplex sensitization when compared to healthy controls,” the authors noted. The studies varied widely in their methodology and how they measured parasites. Two thirds of these 39 studies reported infection rates of 10% or less. For the detection of parasites, stool examinations alone or in combination with other investigations were performed in 37 studies. Other tests included serology (including measurements of total and/or specific anti-parasitic IgE/IgG levels, n=6), blood eosinophil counts (n=6), skin prick tests (n=2), PCR (n=1), basophil activation test (n=1) and duodenal fluid aspiration (n=1). In some studies several investigations were performed. Patients with chronic urticaria more frequently had seropositivity of fasciolosis, Anisakis simplex sensitization and presence of Blastocystis hominis allele 34 (ST3) as compared with control subjects. In 21 studies, efficacy of treatment with anti-parasitic drugs ranged from 0 to 100% (35.7% of 269 CSU patients benefitted). In 9 (42.8%) of 21 studies more than 50% of efficacy was observed. Treatment with parasitic drugs varied widely as well. In 21 studies, efficacy of treatment with anti-parasitic drugs ranged from 0 to 100%. In 9 (42.8%) of 21 studies more than 50% of efficacy was observed. Patients also responded to a fish-free diet, and in some studies, patients with detectable specific IgG4 against Anisakis simplex fared better than those without IgG4.